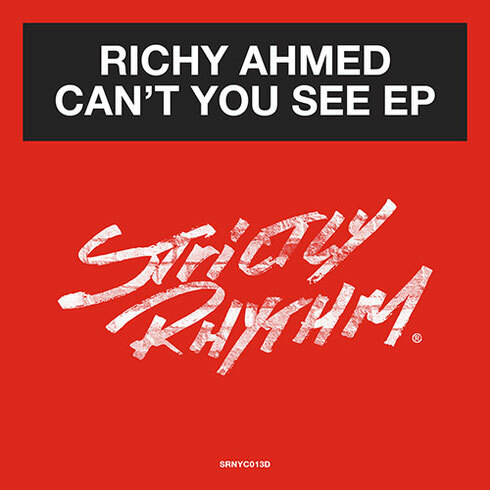 As possibly one of the most exciting talents rising out of the UK, there is possibly no better time for DC-10 resident Richy Ahmed to team up with New York house imprint, Strictly Rhythm, and release the ‘Can’t You See EP’. Opening with a hard-hitting 4/4 beat ‘Can’t You See’ features a funk-laden, walking bassline adding fluidity to the mix, calling on the sound of the ‘80s and bringing it in to the present day. Analog synth sounds are peppered amongst bluntly cut vocal samples, drawing inspiration from the clinical elements of techno, yet retaining the groove that Ahmed’s work is probably becoming synonymous with. The EP’s second track is his remix of Logic’s 1990 classic ‘The Warning’. The original’s acapella has been repurposed by him, looming over the track’s driving percussive elements. With a low-slung bassline interchanging with sizzling hi-hats, the remix pulls the original away from its blissed-out roots and firmly into the warehouse, providing new meaning to one of the legendary Strictly Rhythm’s classic club anthems. It’s out 13 July, check it out below.